A blog about Software Engineering. Suppose we have a very large collection of items and need to select the first N, according to some criterion. In this article I will show you an efficient algorithm based on the heap data-structure and explain how to implement it using standard Java features. Now we'd like to find the highest 10 achieved scores. As our game has become quite popular, this list is very long. Let's say we've gathered a few millions of records. This is a task most suited for a heap data-structure. There are many variants of heap, of which the most basic and commonly known is binary (or 2-regular) heap. 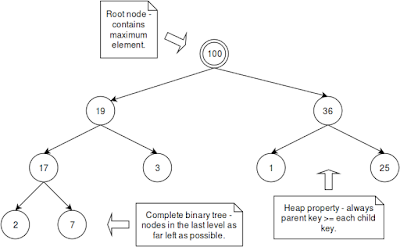 Binary heap is a complete binary tree which satisfies the heap property - the key stored in each node is greater than or equal to the keys in the node's children, according to some total order function. 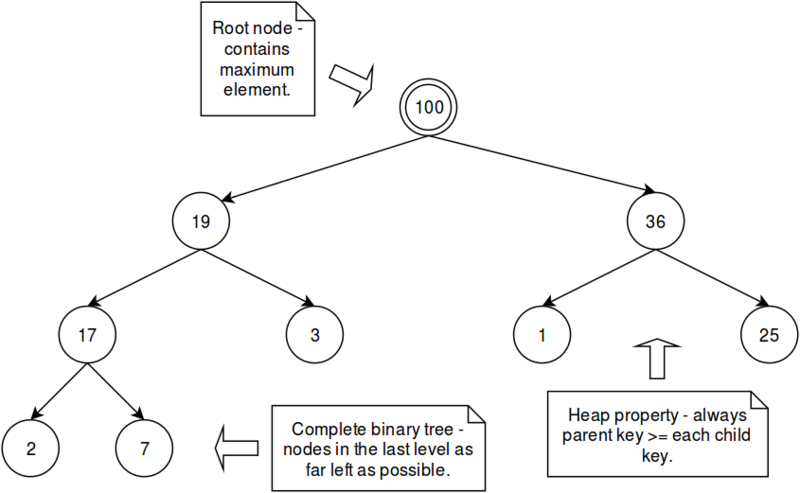 A complete binary tree is, put informally, a binary tree for which every level, except possibly the last, is completely filled, and all nodes in the last level are as far left as possible. You can find a more detailed explanation and implementation details on the Internet. a min-heap, where the heap property is inverted and root node contains the minimum element. Therefore the distinction between max-heap and min-heap lies purely in what ordering function it takes. It is, however, a useful abstraction that simplifies communication and reasoning about heap behaviour. So how can we use a heap to solve the problem at hand? a positive number N. Supposing M >> N.
1. Build a min-heap of size N by inserting the first N elements. b) Delete the current minimum. a) Find and collect minimum. 4. Return collected elements, in reversed order. A sequence of top N elements of the input sequence. the top N elements of the N+i-th prefix of the input sequence. Therefore, at the end of step 2, after all items have been processed, it will contain the top N elements of the whole sequence. Note that we've used a min-heap, even though we're interested in the N largest elements. This is an important trick that allows us to easily drop the smallest of the current N+1 largest elements in step 2b. Conversely, at the end in Step 4, we need to reverse the order of output, because the heap will give out the N largest elements sorted from the smallest. The total time complexity of the algorithm is O(M log(N)), where M is the size of the input sequence and N is the size of the output sequence. Note that M >> N and so this bound is much better than for e.g. sorting the whole input sequence. Often N is very small, such as 10. In that case the time complexity is essentially O(M). The heap can be implemented using an underlying array of size N. Therefore the space complexity of this algorithm is O(N), which is also very good. Now that the algorithm is clear, let's look at how we can implement it in Java. The standard library provides a binary heap implementation under a class named PriorityQueue. unbounded queue and the array will grow as needed. Using PriorityQueue the algorithm can be expressed in a straight-forward way. Now that we have the algorithm implemented we just need to provide the representation of a record and the ordering function for our specific use-case. The @Value annotation comes from Project Lombok and denotes a value-object. It is just some syntactic sugar that allows to make our class definitions clearer. The compiler will augment the AST - make all those fields private and final, generate a corresponding getter for each of them plus an all-arguments constructor. This will give us the 10 greatest scores achieved in our game. In this article we've seen a brief overview of the heap data-structure and demonstrated, based on a use-case, one type of applications it is very useful for. You can find the complete code on GitHub under dusan-rychnovsky/top-n.
Today, the Internet is flooded with web pages describing individual patterns, including Visitor. However, these pages only include trivial examples, which provide little help when implementing Visitor in a real-world application. Unfortunately, the Design Patterns book does not include any more advanced examples either. Because a tree is inherently a recursive data structure, it is a good idea to follow the Divide and conquer principle when implementing these operations - to assemble the result for a given node based on the results for it's child nodes. This is where the simple implementations fall short. In this article I'd like to present a slightly modified implementation that supports easy and efficient access to sub-results. As an example, suppose that we need to store and evaluate boolean expressions. A boolean expression can be represented as a tree-like structure, with atomic propositions as leaf nodes and boolean operations as intermediary nodes. The evaluation of such an expression is a great case for Visitor. Disjunction - a disjunction of two expression. Let's first focus on the Visitor implementation. The following is a generic Visitor interface. For every operation (such as evaluating an expression), we'll create a separate implementation. It is important to note that this interface is parametrized - here T stands for the type of result of the represented operation. Every method accepts an expression of some kind as an argument and returns the result of applying the represented operation on that expression. This allows us to implement these methods using recursive calls according to the expression structure, as we'll see below. This is where this approach differs from those presented in existing articles. In our case, T is going to be Boolean, as evaluating a boolean expression results into a single boolean value. For other operations this could be different. Let's now take a look at the implementation. "Missing valuation for atom [" + atom + "]." Please note again how applying the Divide and conquer principle resulted into a very clear and concise implementation. The last piece of puzzle is the Expression interface. It looks as follows. The important part is the accept method declaration. It is generic, which allows to use it together with a Visitor of any result type. For the sake of completeness, let's now look at the rest of the Expression hierarchy. Lastly, the following snippet shows how to put all the pieces together to evaluate a sample boolean expression. Compared to traditionaly presented Visitor implementations, the one described in this article offers greater flexibility and allows to take advantage of the Divide and conquer principle, which is very convenient when dealing with recursive data-structures. The cost is a certain complexity increase due to the introduction of generic types. If you have any questions and/or comments, please don't hesitate to contact me. I'll appreciate any feedback!